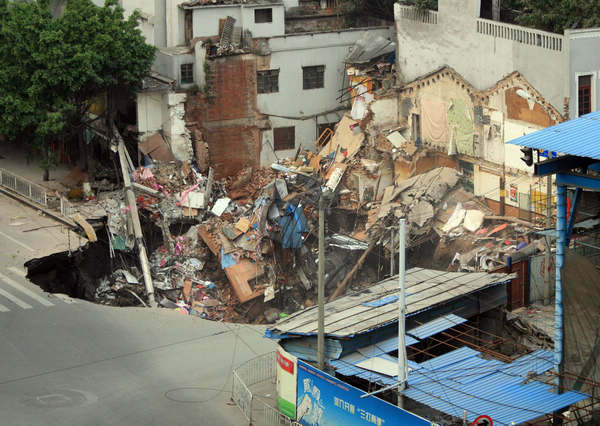 On Monday afternoon (28/1/2013), three buildings collapsed after subsidence in Guangzhou. The incident happened near a metro tunnel construction site. It is reported that metro workers spotted land subsidence near the project site and immediately the area was evacuated, hence no casualties have been reported. The subsidence area was about 10m deep and extended about 100m2. It is also reported that the area is temporary stabilized by backfilling concrete into thesubsidence. The site is monitored for risk assessment. Tunnel construction with a fast pace and lowered standards could lead to disaster. Land subsidence can be caused by a variety of factors. Tunneling in urban areas always includes careful consideration and monitoring of land movement.